First Listen: Beachwood Sparks, 'The Tarnished Gold' The charming L.A. band recently reassembled after a lengthy hiatus, yet its first full-length album since 2001 still meets at that misty midpoint between '70s singer-songwriter pop and harmony-intensive Americana, with a light dusting of psychedelia to enhance the dreamlike effect. 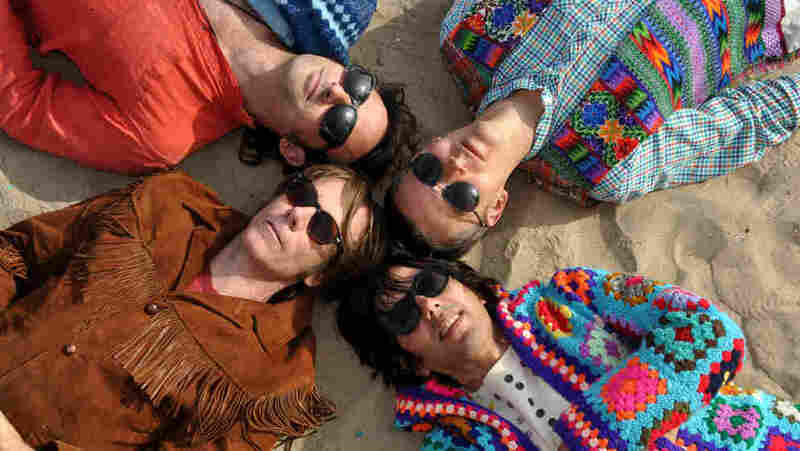 Beachwood Sparks' first album in 11 years, The Tarnished Gold, comes out June 26. It's easy to fall into the trap of thinking that every piece of music needs to be important; that it must impart something meaningful, reinvent, redefine or otherwise aspire to greatness. Next to the groundbreaking, the merely happy-making can seem too minor to merit discussion, let alone celebration. But the ability to convey the soothing breeziness of a warm summer evening is no trifling matter for those craving comfort and escape. The charming L.A. band Beachwood Sparks recently reassembled after a lengthy hiatus, yet its first full-length album since 2001 still meets at that misty midpoint between '70s singer-songwriter pop and harmony-intensive Americana, with a light dusting of psychedelia to enhance the dreamlike effect. When it's not drifting into excessive smoothness ("Leave That Light On") or lighthearted goofery ("No Queremos Oro"), The Tarnished Gold shimmers with rare but seemingly effortless prettiness. "Forget the Song," "Water From the Well" and the swoony "Nature's Light" are all winsomely marvelous, but The Tarnished Gold, out June 26, mostly commits itself to establishing a mood rather than dispensing big moments. The result won't likely land on many best-of-the-year lists, but for the most part, those run in snowy gray Decembers anyway. The Tarnished Gold is an album for right now — a subtle but crucial ingredient to enhance and accompany your June sunsets, July drives and August barbecues.